Homo rudolfensis (also Australopithecus rudolfensis) is an extinct species of the Hominini tribe known only through a handful of representative fossils, the first of which was discovered by Bernard Ngeneo, a member of a team led by anthropologist Richard Leakey and zoologist Meave Leakey in 1972, at Koobi Fora on the east side of Lake Rudolf (now Lake Turkana) in Kenya. The scientific name Pithecanthropus rudolfensis was proposed in 1978 by V. P. Alekseyev who later (1986) changed it to Homo rudolfensis for the specimen Skull 1470 (KNM ER 1470). It remains an open question whether the fossil evidence is sufficient for postulating a separate species, and if so whether this species should be classified as within the Homo or Australopithecus genus. 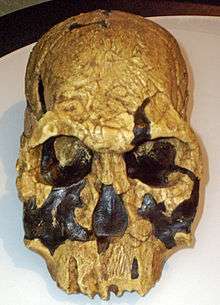 On 8 August 2012, a team led by Meave Leakey announced the discovery of a face and two jawbones belonging to H. rudolfensis. The fossil KNM-ER 1470 was the center of much debate concerning its species. The skull was at first incorrectly dated at nearly three million years old, predating the Homo habilis species. Since then, the estimate has been corrected to 1.9 million years, but the differences in this skull, when compared to others of the Homo habilis species, are said to be too pronounced, leading to the presumption of a Homo rudolfensis species, contemporary with Homo habilis. It is not certain whether H. rudolfensis, H. habilis or some, as of yet undiscovered, third species was ancestral to the later Homo line. In March 2007, a team led by Timothy Bromage, an anthropologist at New York University, reconstructed the skull of KNM-ER 1470. The new construction looked very ape-like (possibly due to an exaggerated rotation of the skull) and the cranial capacity based on the new construction was reported to be downsized from 752 cm³ to about 526 cm³, although this seemed to be a matter of some controversy. Bromage said his team's reconstruction included biological knowledge not known at the time of the skull's discovery, of the precise relationship between the sizes of eyes, ears, and mouth in mammals. A newer publication by Bromage has since increased the cranial capacity estimate back up, from 526 cm³ to 700 cm³. Comparisons between fossil OH 24, recognized as a Homo habilis skull discovered by Peter Nzube, along with the female H. habilis fossil KNM ER 1813, and KNM-ER 1470 (male) have brought much controversy as to whether H. rudolfensis and H. habilis should be classified as two separate species or lumped together into H. habilis. When compared to other older H. habilis fossils like OH 24, the mandible and jaw of ER 1470 do not fit within the limits of variation of H. habilis. KNM-ER 1470 displays less prognathism and a rounder brain case. After much debate, but no clear settlement, fossil KNM ER 1813 was found in 1973 by Kamoya Kimeu, which helped settle some disputes regarding the H. habilis and H. rudolfensis species. When compared to ER 1813, ER 1470 manifests a larger braincase ranging from 750-800ml. Even if sexual dimorphism were considered, the size difference in the mandible and teeth would be too great compared to KNM-ER 1813. Fossil KNM-ER 1470, a male H. rudolfensis, has massive teeth in comparison to the female H. habilis fossil KNM-ER 1813 and portrays a much larger brain case than KNM-ER 1813. When KNM-ER 1813 and KNM-ER 1470 are compared to OH 24, similarities between OH 24 and KNM-ER 1813 are more widely evident than with KNM-ER 1470. These similarities include smaller orbits, the projection of the mid-face below the nose and a smaller skull size over all. The assumed ages of these three fossils, the places where they were found and some of the anatomical similarities between them leads many scholars to assume that the two species – H. habilis and H. rudolfensis – co-existed somewhere in the East African area sometime between 2.0 and 1.5 million years ago along with Homo erectus and Paranthropus boisei. In August 2012, a team led by Meave Leakey published an academic paper in Nature announcing three additional H. rudolfensis fossils from northern Kenya had been found: two jawbones with teeth and a face. The face (fossil KNM-ER 62000) was of a juvenile, but had features in common with KNM-ER 1470, suggesting that the latter skull's uniqueness is due to being a separate species, rather than a large male H. habilis. Team member Fred Spoor described the face as "incredibly flat", with a straight line from the eye socket to the incisor tooth. The jawbones, which appeared to match KNM-ER 1470 and KNM-ER 62000, were also shorter and more rectangular than known H. habilis specimens. The fossils were dated to about two million years ago, being contemporaneous with H. habilis. According to Leakey et al., "the new fossils confirm the presence of two contemporary species of early Homo [that is, habilis and rudolfensis], in addition to Homo erectus, in the early Pleistocene of eastern Africa". Lee Rogers Berger, however, called the argument "weak", and proposed the finds be compared to other possibilities, such as Australopithecus africanus and Australopithecus sediba. Tim D. White of the University of California also challenged the findings, asking, "How can practitioners in this field possibly expect to be able to accurately identify fossil species based upon a few teeth, jaws, and lower faces in light of what we know about the great variation found among different individuals in a single living species?" Leakey replied, "I would challenge Tim to find any primate in which you would see the same degrees of variation as those that we are seeing between our new fossils and KNM-ER 1802". KNM-ER 1802 is a lower-jaw fossil that is thought to be of a Homo rudolfensis. Given the difference between this fossil and the ones found in 2012, Leakey has proposed that the fossil is not of a H. rudolfensis, but possibly, of a H. habilis. Bernard Wood considers that it is "perfectly possible" that there were interactions between these different species. ↑ Wood, B. (1999). "'Homo rudolfensis' Alexeev, 1986: Fact or phantom?". Journal of Human Evolution. 36 (1): 115–118. doi:10.1006/jhev.1998.0246. PMID 9924136. ↑ John Hawks (31 March 2007). "KNM-ER 1470 is not a microcephalic". 1 2 Than, Ker (29 March 2007). "Controversial Human Ancestor Gets Major Facelift". LiveScience. Retrieved 8 August 2012. ↑ Bromage, TG, McMahon, JM, Thackeray, JF, et al. (2008). "Craniofacial architectural constraints and their importance for reconstructing the early Homo skull KNM-ER 1470". The Journal of Clinical Pediatric Dentistry. 33 (1): 43–54. PMID 19093651. ↑ Chip Clark (6 May 2014). "KNM-ER 1470". Retrieved 20 April 2014. ↑ Stuart, Humphreys (3 December 2009). "Homo rudolfensis". Retrieved 20 April 2014. ↑ Ghosh, Pallab (9 August 2012). "Many human 'prototypes' coexisted in Africa". BBC News. Retrieved 8 August 2012. 1 2 Leakey, Meave; Spoor, Fred; Dean, M. Christopher; Feibel, Craig S.; Antón, Susan C.; Kiarie, Christopher; Leakey, Louise N. (8 August 2012). "New fossils from Koobi Fora in northern Kenya confirm taxonomic diversity in early Homo". Nature. 488 (7410): 201–4. Bibcode:2012Natur.488..201L. doi:10.1038/nature11322. PMID 22874966. Retrieved 9 August 2012. 1 2 Wayman, Erin (8 August 2012). "Multiple Species of Early Homo Lived in Africa". Smithsonian Magazine. Retrieved 9 August 2012. 1 2 3 Landau, Elizabeth (8 August 2012). "Fossils complicate human ancestor search". CNN. Retrieved 9 August 2012. 1 2 Kaplan, Matt (8 August 2012). 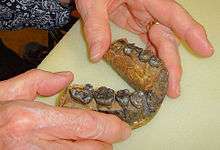 "Fossils point to a big family for human ancestors". Nature. Retrieved 8 August 2012. 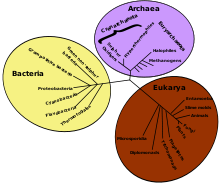 Wikimedia Commons has media related to Homo rudolfensis.